An independent, not-for-profit organisation that is funded by the generous donations of people who care about the health of current and future generations. The average Australian consumes somewhere around 15 or 16 teaspoons of added sugar ever day. Teenagers have more than 20 teaspoons. According to the WHO guidelines, for optimal health we should limit our added sugar intake to 6 teaspoons a day. 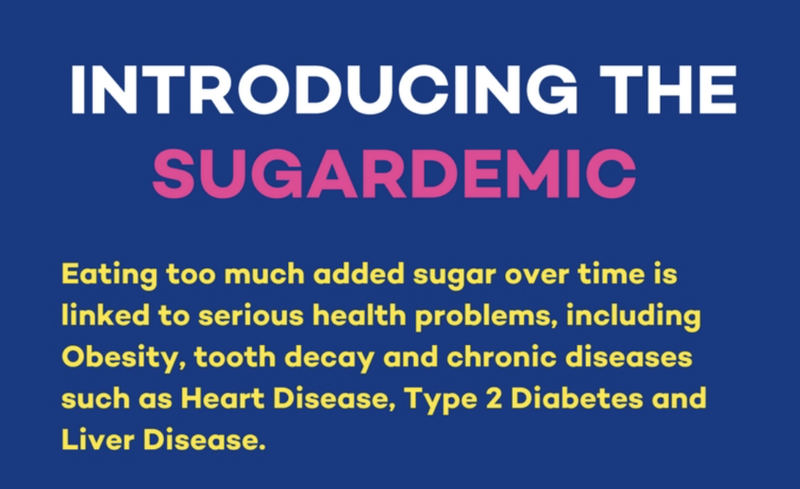 Sugar By Half aim is to cut Australia’s average added sugar consumption by half – from 16 teaspoons of added sugar per day to 8 teaspoons or less per day which would bring our average consumption within the WHO guidelines. This would be one of the quickest, cheapest and most effective ways of preventing chronic disease and giving our kids the best opportunity to live healthy lives. 1 in 3 Aussie kids will be overweight or obese by 2025. GLOWING SKIN Sugar causes inflammation and lowers immunity. Less sugar means less acne and redness, and a reduction in coldsore breakouts. A HEALTHY WEIGHT Sugar’s packed with empty calories. With childhood obesity skyrocketing, cutting down on sugar could mean a longer, healthier life for you and your child. A BEAUTIFUL SET OF NUMBERS If you’ve got issues with cholesterol or blood sugar, a reduction in sugar should improve things. A CLEAR MIND Less sugar means blood sugar levels stay even throughout the day, aiding concentration and focus – improving performance at school or work. MORE ENERGY Spikes and slumps in blood sugar levels are responsible for the famous 3pm slump. With less sugar, your family’s energy levels will stay more even all day, meaning everyone will be just as energetic at 3pm as they were at 10am. FEELING HAPPIER Sugar highs and lows can be linked with mood swings. Less sugar means a better mood. HAPPY KIDS Kids who no longer suffer from sugar rushes and crashes are happier kids. And happy kids make for happy parents.